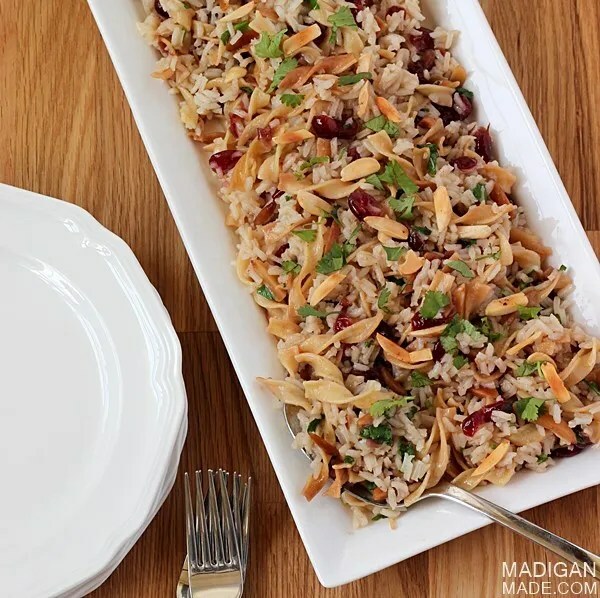 Madigan made… a side dish for a fab blogger progressive dinner! Today I am joining up with eleven other awesome bloggers to bring you a bunch of tasty ideas to get you ready for the holiday entertaining season. Fun, right? I’m in charge of “bringing” a side dish, so I thought I’d share with you a tried and true favorite from our home. 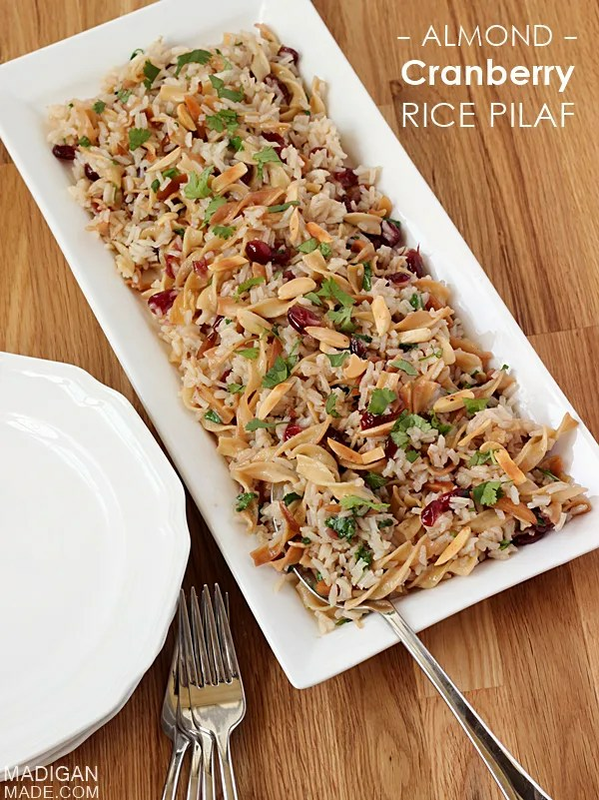 My husband grew up with his mom making this rice pilaf all the time. After trying it years ago, I immediately loved this recipe because it is easy to make… and delicious! 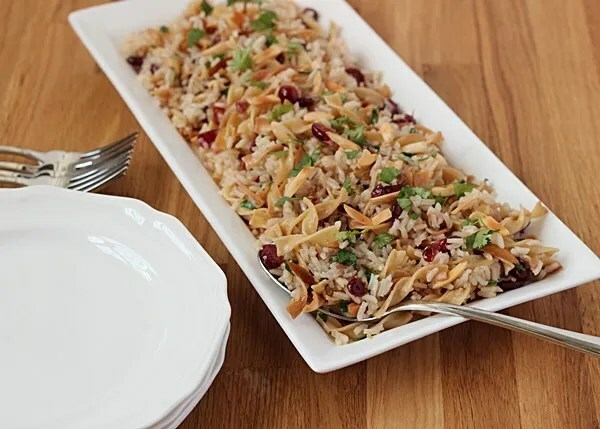 To dress the dish up a little for the holidays, I decided this time to add in a few almonds, cranberries and herbs. 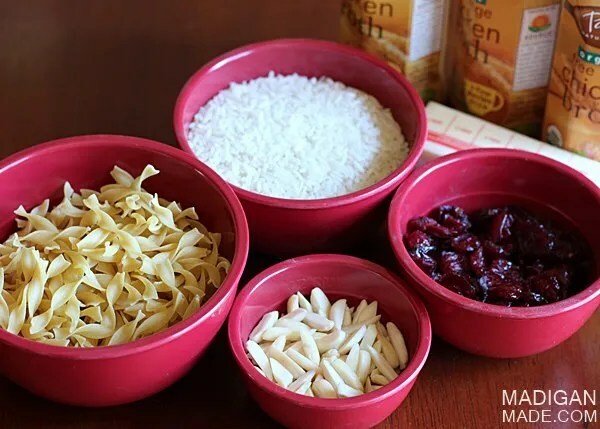 You can certainly make this recipe without those things, but I like the sweetness, crunch and color these ingredients added to the dish. Plus, I love cranberries, remember? They seemed like the perfect addition to the dish for this time of year. In a separate, small pan, warm up your chicken broth. Then, in a dry pot, heat the almonds and stir them over medium heat until they are lightly toasted. Add the butter and uncooked noodles. Stir them constantly until the egg noodles are lightly golden in the melted butter. Add the rice, cranberries and heated broth to the pot. Stir once and bring the rice to a boil. Then, cover and simmer the rice for 15 minutes. Remove from heat and allow the rice to rest covered for another 15 minutes. Toss in the chopped cilantro and serve! I’m telling you, this recipe is so simple and so good! Want to see what all the other talented bloggers are serving for this huge holiday meal? Your eyes will not go away hungry, I promise! Just click around from recipe to recipe and check them all out! Oh, and GUESS WHAT? While you are getting some holiday dinner inspiration, all of the other gals are hosting a great group giveaway on their blogs today, too. You could win a $200 gift card to a store of your choice! (Like you needed another reason to hop around and scope out these recipes?!) Go enter! TGIF my creative friends! Hope you have a wonderful (and crafty!) weekend!